Born and raised right here in Wynnefield, Dwight picked up his first set of clippers at the age of 14. He started out cutting hair right in the basement of his mother’s house while she allowed him to hone in on the craft. He graduated from Tri-City Barber School in 1996 and became a licensed barber manager soon after. After working in a couple of other barber shops, Dwight decided it was time to go into business for himself. 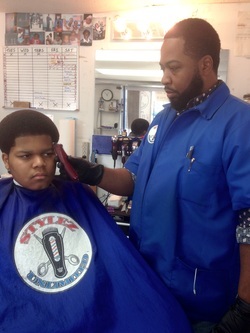 Looking to create a wholesome, family-friendly atmosphere, Dwight set up shop with one other barber and opened the doors to Stylez Unlimited in July of 2003. The vision of Stylez Unlimited was built around working for the “common man”. To help people just like himself with families and children have a respectable place to go for a quality haircut experience. He wanted a place where clients could feel safe, relax, run into old friends, and just connect. A place where men and women felt comfortable and welcome. At any given time, he might cut three generations of a family. Dwight sees his role as an art and a service. His personal motto: “I don’t just cut hair, I build self-esteem”. He enjoys bringing a certain confidence to customers when they experience the benefits of a great cut. Clients have shared how their confidence was boosted going into a job interview, on a first-date, playing in a big game, even spending Christmas with the family. Dwight is a God-fearing man, husband, and father of four wonderful children. Mike was born in Tampa, Florida raised in Wynnfield. Mike picked up his first pair of clippers when he was 17. He started out cutting his cousins just for fun, nothing serious. He never knew how this seed would manifest itself. Mike also was a client of Dwight's for years. After a discussion of what career path he should take after graduating high school, Dwight offered him a job as a barber if he went to barber school. He has been cutting professionally since the birth of Stylez Unlimited 2003. Mike enjoys what he does and loves to help others build their confidence with every haircut. Oh yeah... He also loves the TAMPA BAY BUCCANEERS!!!! !